Expanding end user segments including cosmetics, packaged food industry, pharmaceuticals, paints, pesticides, distillery products, introduction of colour variants in corrugated box and rising number of manufacturers has pushed China corrugated box market forward during the review period. 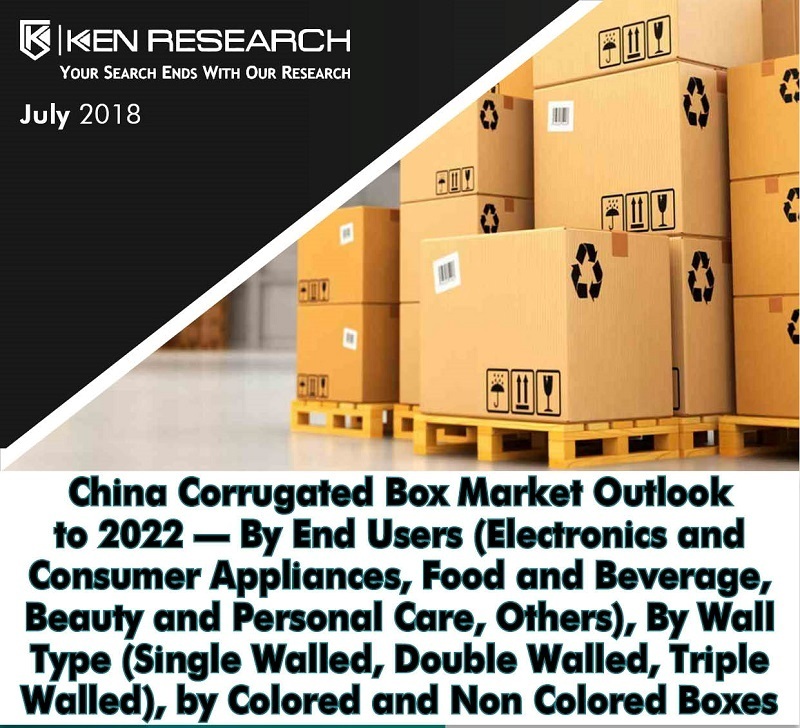 The report titled “China Corrugated Box Market Outlook to 2022 – By End Users (Electronics and Consumer Appliances, Food and Beverage, Beauty and Personal Care, Others), By Wall Type (Single Walled, Double Walled, Triple Walled), by Colored and Non Colored Boxes” by Ken Research suggested a growth at a CAGR of close to 9% in China corrugated box market by 2022. The sale of corrugated box has increased registering an annual growth rate of close to 10% in 2017. The corrugated box not only caters to the packaging needs of the end user but also protects the environment as its products are 100% eco-friendly. Factors such as increasing demand from fresh food and beverages, home & personal products, electronic goods industries, logistics application, increasing consumer awareness towards sustainable packaging and growth of the E-commerce industry have propelled the growth of the Chinese corrugated boxes. During the period 2012-2014, the production of corrugated boxes increased by 10 million tons. The period saw an unprecedented level of growth from 2013-2014 when the production of corrugated boxes grew at a double digit growth rate. China’s economic slow-down affecting demand from the downstream industries, fluctuation in prices and tightening environmental regulation forced many small players to shut down their operations. Environmental concerns have been taken during the period such as developments in lightweight boxes and resource-effectiveness. The period between 2016 and 2017 witnessed huge fluctuation in the prices of the corrugated boxboard paper prices. The price of the corrugated boxboard paper rose from RMB 4,810/ton in 2016 to RMB 5,690/ton in 2017. The price fluctuation trend is expected to be continued in 2018 because of the China’s imposed ban on the import of waste paper, which is an essential ingredient in the manufacturing of corrugated board, from western nations. The industry introduced new heavyweight products such as billerud flute semi-chemical fluting. Primarily, targeted at replacing wooden packaging, this product is also able to replace double-walled board with an overall lighter weight single wall substitute. These factors have together contributed in the development of the market.